If you are currently are a user, contact us with any problems or questions. (260)484-8445 or rkeefer@fortwaynemedlab.com. Since 1905, the Fort Wayne Medical Laboratory has offered local physicians and their patients state-of-the-art medical laboratory services. We take personal pride in the quality of work performed and the services offered. Our tests are performed by trained professionals and technologists who carefully scrutinize the results. We've made a point to ensure that FWML operates in accordance with the highest standards of the profession. FWML is certified by the Health Care Financing Administration (HCFA), Clinical Laboratory Improvement Amendments (CLIA). licensed by the state of Indiana Health Professions Bureau & accredited by Joint Commision. A reason FWML continues to grow is its expertise in Anatomic Pathology service including, but not limited to, dermatopathology, gynecological pathology, gastrointestinal pathology, genitouinary pathology and hematopathology. We pick up specimens and deliver test results wherever they are needed, most within 24 hours. You can also order tests on a "stat" basis. Perhaps most importantly, we offer personalized local service. Pathologists at FWML usually call you with stat or unexpected diagnoses. Moreover, FWML professionals at all levels, from technologists to pathologists, are available for consultation. 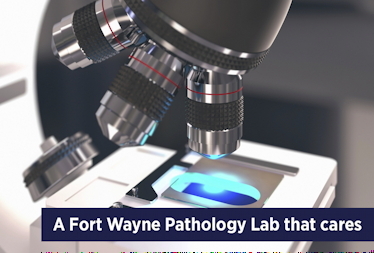 As Fort Wayne Medical Laboratory continues to improve its services, we hope to make it an even more vital part of this area's high-quality health care delivery system.